Drug Metabolism in Diseases is a comprehensive reference devoted to the current state of research on the impact of various disease states on drug metabolism. 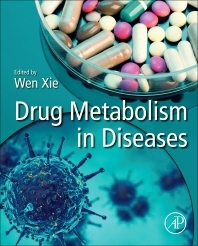 The book contains valuable insights into mechanistic effects and examples of how to accurately predict drug metabolism during these different pathophysiological states. Each chapter clearly presents the effects of changes in drug metabolism and drug transporters on pharmacokinetics and disposition. This is a unique and useful approach for all those involved in drug discovery and development, and for clinicians and researchers in drug metabolism, pharmacology, and clinical pharmacology. While much has been written and stated about the role of detoxification pathways in our world that continues to experience both increases in xenobiotic exposure and use of pharmaceuticals, very little has been written or stated about the fact our ability to metabolize these realities of everyday life is heavily influenced, via production of inflammatory mediators, by other everyday issues ranging from minor injuries to colds and flu. This book is one of those very rare references that details this important but generally ignored and overlooked aspect of detoxification. A must read for any practitioner who deals with the clinical application of detoxification pathways.